The thing is, he had a huge heart. I reckon that’s why he was able to hang on for so long, Henrik said, because of that big heart of his. You think I’m tall, but my brother was half a head taller still. He took a beating, though. Imagine doing that many drugs for so many years—it’d destroy anyone. But Mati always had that air of youth about him, Henrik sighed, through all the lapses and relapses, even when what came crawling out of the gutter was no longer my brother but a stinking rag. Amazing how much a body can change. I should know, I’ve carried Mati down this city’s grimmest alleys. Passed out in a corner of the market, all swollen and barefoot. More than once it was me who had to get him out of there, and I’m telling you, it got easier and easier to carry him down those alleys. Drink makes you bloated, but the drugs made him lose so much weight there was only a bag of bones left to throw over my shoulder. On one of those trips from the station, when I’d already given him up for dead, he opened his eyes very wide and looked at me with that smile I told you about before, the one he’d had ever since he was a kid and that could win anybody over. The lake trip I was telling you about was after Christmas. Mati had graduated from high school the year before—I remember exactly when, because he’d just pulled one of his little stunts. You know he used to disappear two, three, four weeks at a time, sometimes more. But it was already December and we hadn’t seen him for a month, so my parents decided the three of us would spend Christmas in Antigua. When we got back to the city, my mum turned on the lights and we discovered in the middle of the garden the old ceiba, same as always, except it had been turned into a Christmas tree. Mati had taken all the shoes out of our wardrobes and used them to decorate it. There were shoes right at the top, I’ve no idea how he managed it. My trainers were hanging off a twisted branch, and on another one further over I could see a pair of my mum’s heels dangling precariously. She stood for a while looking at it all and then turned and went into her room. But my dad stayed there contemplating the tree, trying to decipher some meaning in the decorations, I guess, and when he turned to look at me he said, well, doesn’t look half bad, does it? That was the kind of thing my brother used to do. Not long after that, things started going downhill, but back then his antics still revealed a sort of wild, boundless affection. The next day he came by the house to give us a hug and say happy new year, though it wasn’t actually New Year yet, and nobody mentioned the ceiba. There we were, only yards from our new Christmas tree, right there on the other side of the window, but my brother didn’t mention it—he’d probably forgotten—and no one else brought it up. We had eggs and my mum’s smørrebrød for breakfast. After they’d finished their coffee my brother took my dad into the study where he kept him talking for ages. On the other side of the table, my mum took little sips from her cup and avoided my gaze. We knew it was only a matter of time before the old man caved and gave him some money. When they came out of the study Dad looked at the floor, pleased to have Mati’s hand on his shoulder, and it made me sad to see him like that, ashamed and happy all at once. Mati went to stay at Tavo’s house by the lake. Tavo was his partner in crime back then. He later killed a guy down on the coast and wound up in trouble with some bad people. But at the time my brother and Tavo were thick as thieves, thicker than thieves, because they’d egg each other on over the stupidest things, always needing to one-up each other. The night they arrived at the lake, Tavo got the idea to go into town looking for hookers to bring back to the house. They picked two up near Avenida Santander, and Tavo, jumpy from all the drugs, started trying to be smart, talking tough, playing the hard man, and the whores said less and less, and looked at one another more and more. At some point, a knife appeared out of the back seat, up against Tavo’s throat, and then the car went silent. A mile down the road the hookers got out, each one with a wallet in her hand. That was one of the stories doing the rounds back then: the time Tavo and Mati were mugged by a pair of hookers. That was the night of the thirtieth, and they decided to shake it off by throwing a wild party at the lake house. I’ve been in the living room of that house, I’ve seen the huge window that opens out onto the garden, the lawn sloping gently down to the shore. The view of three volcanoes in the distance is so beautiful it almost hurts. Drugs aren’t my thing, you know that, but if I had to pick a place to get high I’d say there, in front of that living room window. That would be the perfect place. They chose well, the bastards. And they had their party. Years later my brother would wind up begging for surgical spirits from the pharmacy in Zone 3, but back then he was still riding high on the wave, teetering right on the crest. The two of them must have looked rough as the lake in December by the time they had the idea to go diving. Only someone that high could think of going so low. Tavo told me later that they weren’t drunk, and that anyway their minds were perfectly clear, with that clarity you get when you’ve been tripping for a while. 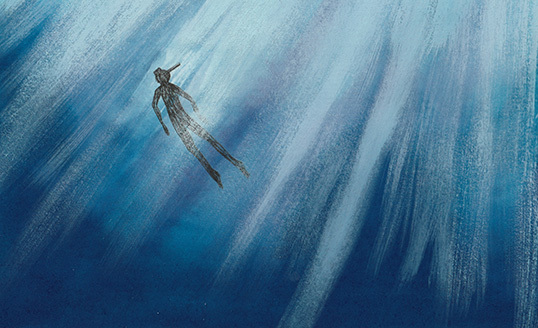 The thing is, Tavo was an experienced diver, a licensed diver, but Mati was just a boy, a boy riding on the crest of the wave, keen to get to the bottom of everything. Around that time a load of Mayan ceramics had been discovered on the eastern shore of the lake, around Santa Catarina Palopó, and there was a lot of talk about a submerged Mayan city. People round there had found bits of pottery on the beach with red and ochre designs, and they reckoned there’d been a ceremonial site on an island near the shore. But the water level had risen, drowning it all. That would have been hundreds, probably thousands of years ago. I can imagine exactly how it all looked that morning because I’ve seen it myself. You’ve got the three huge volcanoes on the other side of the lake, the shore skirting their flanks as it runs round the basin. At that time of day everything looks sharp but also very still. When the sun rises behind you the tips of the volcanoes start to glow and the light descends the slopes until it reaches the lake. It’s so clear you can see everything that’s going on in the water too—the fish in a morning daze, slipping lazily along the current. Tavo decided they’d take the boat out, so they pushed off from the pier in front of the house in that amazing morning light. They followed the coast of Santa Catarina toward Agua Escondida. Obviously they both thought they knew exactly where the submerged city would be, but because they couldn’t agree they decided to drop anchor somewhere in between. That’s how they used to settle their differences—they were always good at that, you know. In the still-purple sky high above them, my brother spotted three stars in a row. This upset him, according to Tavo, though it’s hard to know for sure what exactly it was he’d seen. Tavo says he refused to put on the diving kit after that. My brother had always felt connected to nature, to country life, and I think that’s why he was mistrustful of man-made things, of any instrument that got in the way of that closeness. So Tavo put on his kit, did all the necessary checks, and dropped backward into the water. Mati took a while longer, but before long he was in too, wearing a mask and snorkel. It’s cold, that lake—you know what it’s like in December. But they probably had plenty of fuel in the tank, the kind of energy you get from drugs. Tavo went down about twenty feet and my brother followed him from above like a pilot fish, looking at everything his friend pointed to with the little trident he was holding. As they went on they reached a ravine where the lake bed dropped away sharply into darkness. They changed direction and skirted along the edge of the precipice instead. My brother dove down from time to time, looking more closely at the rocks and fish Tavo kept pointing out with his trident. On one of these descents he found that Tavo had stopped and was looking closely at a stone sticking out of the fine sand near the edge of the drop. He came up to breathe and, after taking a big lungful, dove down again. They spent a few seconds looking at the stone. Tavo took out his mouthpiece and offered it to my brother. That way they could stay down there longer, passing the mouthpiece back and forth while they admired what looked like the upper part of a Mayan stela. After a while they moved closer and began to scrape away at the surrounding sand. The stone was smooth, Tavo said, hard and smooth, with carved inscriptions that they traced with their fingertips. As they did so, the lines became more visible, revealing the beginnings of a pattern that extended down beneath the sand. There was a design here, they’d be able to see it soon, Tavo thought, and continued digging at the sand around it. At some point he realised he was the only one working and looked up to find my brother at the edge of the ravine. He was staring, Tavo said, down into the darkness below. He wasn’t moving and Tavo thought about going over to offer him the mouthpiece, but my brother looked so focused, so intent on the darkness, that Tavo stayed where he was by the stela. Then Mati turned and looked over his shoulder at him. This left Tavo cold, he told me, because he realised that something fucked up was about to happen, and he watched apprehensively as, almost in slow motion, Mati’s feet reached for the sand below him. Once he’d found solid ground he bent his knees and pushed off hard for the surface. It took Tavo a second to understand that Mati was going all the way up, that he was about to ascend without a stop. They’d been breathing the compressed air from the tank, and Tavo knew that air would expand as he rose, growing inside my brother’s body until it burst his lungs. He needed to decompress, slow down his ascent, but details like that didn’t figure in Mati’s trip. Tavo let go of the stone and began his own ascent, exhaling continuously in emergency decompression, trying to do the least possible damage. On the surface Mati was floating face up. Tavo pulled off his mask and my brother’s too. His pupils were enormous, he told me. The veins in his neck were blue and swollen, creeping up from his chest to his face like an obscene version of the foliage on the stela. He wasn’t responding. Tavo was talking to him but my brother just floated face up with his eyes wide open. Who knows how he managed to get him into the boat—imagine what that must have been like with a body like Mati’s. But it’s moments like these when you realise what friendship really means, when you’ve no choice but to have nerves of steel. Somehow Tavo managed to pull him up over the edge of the boat and sped off at once toward the public pier in Santa Catarina Palopó. I went to that pier myself a few weeks later to ask people there what had happened. The fishermen said the launch came in so fast it almost smashed into the pier—a couple of them barely had time to get their cayucos out the way. What surprised them most was my brother’s neck, they said. It had swollen up so much it wasn’t really there anymore, as if his body had grown right out of his head. He was a lizard man, said the guy describing him, blue veins running across his whole torso. People crowded round the pier when they heard Tavo shouting. Soon the town ambulance arrived—a jeep turned emergency vehicle. Between a few of them they managed to get my brother onto a stretcher, but he was too long and didn’t fit inside the jeep. In the end they got it in at an angle but had to leave the back door open to make space. Tavo said that all along the main road people were crossing themselves as the jeep went past, two bare feet bouncing up and down over the edge of the open boot. I was in the garden at home when the phone rang. I heard a scream, and then another, and when I went into the living room my mum was on the floor. My dad was trying to comfort her, on his knees beside her. It was strange: the first time in my life I’d seen them like that, from above, their bodies bent in distress. When he saw me my dad stood up and brushed the dust off his knees. Mati’s in a bad way, he said. From one moment to the next, my hearing went. As though from very far away, I heard my dad mention something about my brother’s lungs, a decompression chamber in Miami, that we had to get him there so they could fix him. Fix him? I asked, but my dad just looked down and put his hand on my mum’s shoulder. On the floor, she was clutching her head in her hands. That was our last family trip. My dad called a couple of his friends—fair-weather friends, as it turned out—and one of them contacted someone they knew who had a plane. That was what it was like in those days: people knew people who had planes. This guy agreed to rent us his little jet with its pressurised cabin, for a modest price that would contribute to my family’s future financial ruin. So there we were, in the middle of the runway, waiting with a doctor and my brother on the stretcher. He was covered up with a sheet, wearing an oxygen mask, tubes coming out of his body. The doctor told us that nothing was certain, that once we got to Miami we’d have a better sense of what the options were. The pressure up there would be a problem, he said, pointing at the sky. He was right. We hit a storm and the pilot had to ascend to forty thousand feet to get above the clouds. And that meant he had to increase the cabin pressure. The doctor told my dad that my brother wouldn’t be able to handle it, no sir, the pressure would be too much for his lungs. They’re going to burst, the doctor started to say. He’s going to burst, he repeated more loudly. We waited, gathered around my brother, in the jet’s refurbished cabin, asking ourselves how much his body could take. My dad shouting at the pilot to decrease the pressure, the pilot shouting back that he couldn’t unless he wanted the rest of us to explode instead. And so on we went, bucking on the black clouds, the pilot balancing precariously, the doctor sweating, the three of us resolutely gripping the stretcher, suspended, floating in that strangest of places, waiting for the storm to pass.